Variations in lung cancer care ‘cannot be tolerated’ and many people face ‘unwarranted’ delays in treatment that can have a dramatic effect on survival, according to a new report. 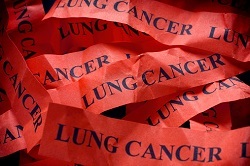 The report by the UK Lung Cancer Coalition (UKLCC) says that just a quarter (27%) of lung cancer patients in England receive an early diagnosis (stage I or II) and only around three quarters of lung cancer patients (72.6%) get treated within the current 62-day national cancer waiting time standard. Lung cancer is the biggest cancer killer in the UK for both men and women with five-year survival rates consistently lagging behind many other countries in Europe. England currently ranks 26th out of 29 countries. The UKLCC believes putting the NOLCP into action, will help achieve its ambition of boosting five-year UK lung cancer survival to 25% by 2025. Studies show there is a 16% increase in mortality if the time from lung cancer diagnosis to having surgery is more than 40 days - putting lives unnecessarily at risk.